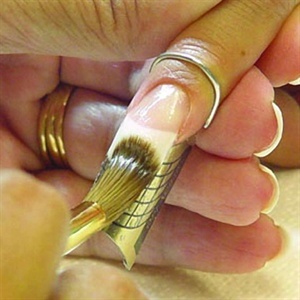 Sculpting nails is the technique used to create a nail extension without the use of a tip; sculpting requires a form to be attached underneath the natural nail’s free edge, then product is applied in nail shape to extend the length; called sculpting because it starts with a ball of product that is molded or “sculpted” into the shape of a natural nail. Competition-level nails take practice, but mastering certain skills will get you in the game. Don’t let service breakdown give you a nervous breakdown. Regardless of what nail medium you’re using — polish, gel-polish, gel, acrylic, or gel-acrylic hybrid — problems are bound to crop up from time to time. Here are some troubleshooting tips aimed at making these common technical failings a thing of the past. Orly GelFX Perfect Fit Forms have a rounded shape under the free edge and square sides that allow for precision application. Candy Coat is offering professionals a preview of its new acrylic line, Hard Candy, with a “try me” kit. Gelish’s Art Form 2-D Technology makes it easy to create defined art with perfect opacity.